When should I take my children to the dentist? It is recommended that children should go to the dentist with their parents as soon as possible. You should then take them regularly, on average once every six months. This will let them get used to the noises, smells and surroundings and prepare them for future visits. The earlier these visits begin, the more relaxed the child will be. How should I clean their teeth? Cleaning your child’s teeth should be part of their daily hygiene routine. You may find it easier to stand or sit behind your child, cradling their chin in your hand so you can reach their top and bottom teeth more easily. When the first teeth start to come through, try using a children’s toothbrush with a small smear of toothpaste. It is important to supervise your child’s brushing until they are at least seven. Once all the teeth have come through, use a small-headed soft toothbrush in small circular movements and try to concentrate on one section at a time. Don’t forget to brush gently behind the teeth and onto the gums. If possible make tooth brushing a routine – preferably in the morning, and last thing before your child goes to bed. Remember to encourage your child, as praise will often get results! All children are different and develop at different rates. The diagram below gives an idea of when the teeth come through. However, teeth can come through in a different order so do not be worried, as your dentist will be able to keep a check on your child’s teeth. Fluoride comes from a number of different sources including toothpaste, specific fluoride applications and perhaps the drinking water in your area. These can all help to prevent tooth decay (caries). If you are unsure about using fluoride toothpaste, ask your dentist, health visitor or health authority. You can get low-fluoride toothpastes, and the general rule is to use a small smear of toothpaste up to 5 years; from 5 to 7 use slightly less than a pea size and a normal pea size from 7 years upwards. Children should be supervised up to the age of 7, and you should make sure that they spit out the toothpaste and don’t swallow any if possible. There are many different types of children’s toothbrushes available, including brightly coloured brushes, some of which change colour, those with favourite characters on the handles and timers that all encourage children to brush their teeth. The most important point is to use a small-headed toothbrush with soft, nylon bristles, suitable for the age of your child. If in doubt, look for the British Dental Health Foundation logo on toothbrush and toothpaste packaging. This logo means that the product claims made on the packet are supported by scientific testing. Teething is another problem and starts when children are around 6 months old. Symptoms may include high temperature, red cheeks, swollen gums and a tendency to dribble. It can be painful, but is often eased by biting on a cold, smooth surface. A child’s sugar-free pain relief medicine or teething gel will often ease teething pains. However if the problem continues, get advice from your dentist. It is also worth remembering that some processed baby foods also contain quite a lot of sugar. Try checking the list of ingredients: the higher up the list sugar is, the more there is in the product. Thorough brushing twice a day, particularly last thing at night, will help to prevent tooth decay. Children can sense fear in their parents, so it is important not to let your child feel that a visit to the dentist is something to be worried about. Try to be supportive if your child needs to have any dental treatment, and if you have any fears of your own about going to the dentist, don’t discuss them in front of your child. 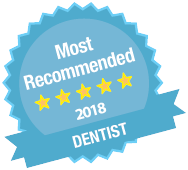 If your child already has a good relationship with the dentist, it is much easier for the child, parent and dentist if treatment does become necessary later on.